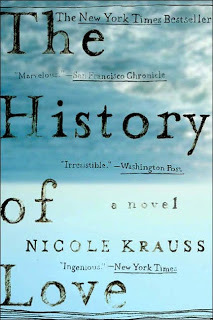 The History of Love by Nicole Krauss A very nice, gentle read. Although the book’s title personally would steer me away (a little mushy don’t you think?) I found the book a lovely portrait of the narrators whose multiple voices unfold the drama throughout the book. “The History of Love” in the novel is a metaphor ridden book about a lost love: “Alma,” Both she and the book are driving elements in the Novel. This entry was posted in A good read and tagged books to read, Nicole Krauss, read this, The History of Love. Bookmark the permalink. i love this book! i found it by happy accident and kept it to read again or to loan; she is a very talented author!